Light Experiments, planned and led by 9M students. In August, I set out the process I’d be using to teach my Year 9s for science this year. Having made it to half-term, how are we doing? As you can see, we have an outline for the year ahead. Of course it will change a little as we adapt and bend, depending on progress an unforeseeable events, but this is so useful and clear! Each team can see where their topic comes up and everyone has an overview. I love the fact that they’ve noted Parents’ Evening and left grey boxes for test follow-up and contingencies – their idea, not mine. The first group to get started was the Light Team. As the pioneers, this was a challenge and they met it magnificently. We did some great practical work early on, with students taking the lead and going around the room helping their classmates to get started. We worked out a good balance of my input and their input in each lesson so that their contribution was significant but so was mine. The ‘co’ is the key to co-construction. Light practical work. The Light Team booked the apparatus. The Light Team also presented some lovely Prezi slides in a couple of lessons. It was their idea to use Prezi (I’ve never used it) and they showed me how to download the ipad app and how to get it working. Reiss shows his Prezi on transmission and absorption of light. We realised that some of the slides were too wordy to be useful in presentation mode but, with the help of the Tech Team, we worked out that the Prezi could be shared with everyone via Edmodo. This will be how we do things routinely in future. All slides will be shared which will save time with taking notes etc. 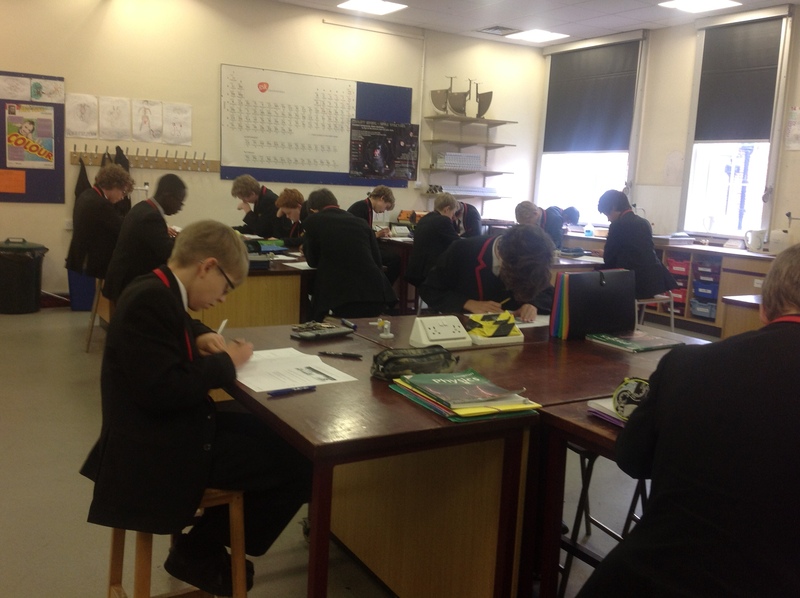 The Light unit ended with a topic test; students have done really well. We marked it quickly in class and are due to revisit the test to close the gap with various misconceptions and common difficulties. A Science Test on Light: Finding out what has been learned. 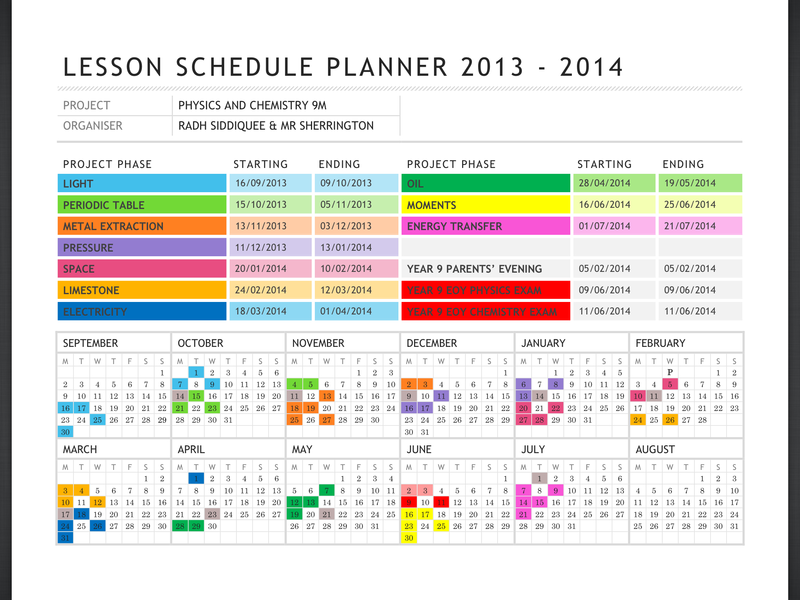 A key aspect of our co-construction process has been the exploration of Edmodo as a learning platform. I spent a lunchtime with the Tech Team where we had student and teacher Edmodo windows open side by side to see what we could do and how it would work. This has led to lots of useful exchanges in between lessons. Initially it was just me posting things but now the students are beginning to spontaneously add information and links. They also send me questions and messages which is fantastic. I’m learning about Quizzes and Assignments but it is early days. There is huge potential. I log all the homework set on Edmodo which is very useful indeed. It has been extremely important to work with technicians so far. The Light Team is seen here on the right, talking to Mr Strudwick, one of our Physics Technicians, to book equipment. On another occasion, I popped into the prep room to find Asad was already there, checking what equipment was available for his next lesson. Asad was taking responsibility; he knew it was down to him to get the lesson organised and he stepped up to the challenge. That’s fantastic for a student in Year 9. On the left, Mr Oxford, Senior Technician, is showing the boys (and me) how to conduct a metals demonstration safely. We did this in 15 minutes one lunchtime. Students learning from technicians: How to do a chemistry demo and ordering equipment for a lesson. The Metals Team is now in full-flow. They are teaching the Periodic Table, chemical properties of metals and the extraction of metals. After an initial short discussion with me, where I explained the core ideas, Daniel sent this lesson plan for their first lesson on electron configurations. Daniel’s lesson plan. Better than most of mine! It was his idea to use incomplete periodic tables as a starter activity. He and his colleagues Ollie and Aidan then explained the electron configuration pattern really well ( 2,8,8,etc) and students had to draw out the first 20 elements. The electron configuration lesson as reported on twitter! Given the status by the process, students are brilliant at assuming the role of expert or leader in the learning process. The practical demonstration of chemical reactions when really well. The Metals Team produced electron diagrams for the elements and then asked students to make a prediction based on the pattern. Note that they suggest a discussion in pairs! This is like teacher training. A great question. Using the theory to make predictions. 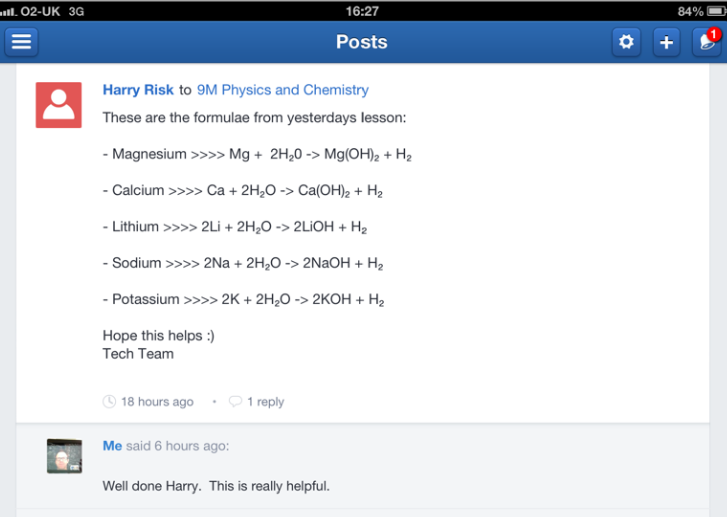 One of the students suggested that we recorded the potassium reaction and then, with minutes, it was posted to Edmodo. I didn’t know it was so easy – or possible. Without the co-construction mindset, this wouldn’t have happened. Another example of that was that one student in the metals team volunteered his own bit of spontaneous ‘awe and wonder’. He shared his wonder at the fact that Sodium, a rare reactive metal, and Chlorine, a highly toxic gas, combine to make Sodium Chloride that is abundant and so safe we put in our chips. 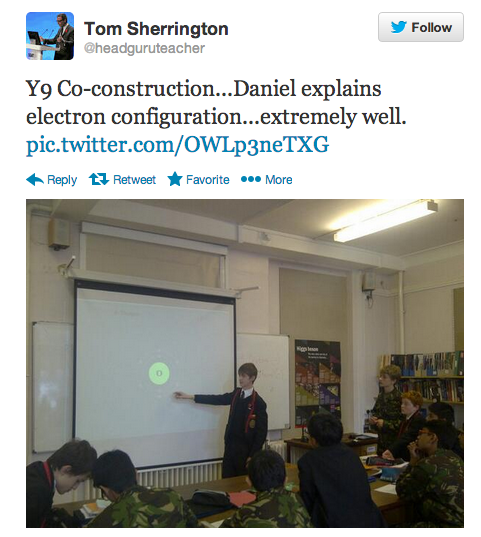 That was all linked to electrons in shells…and it came from him and not me. Using Edmodo to capture the learning. 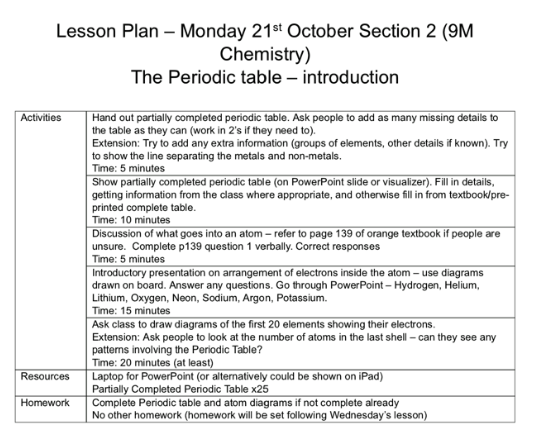 The class has homework over half-term to consolidate this learning linking the equations and electron structures to the reactions and the pattern of reactivity in the groups. So, co-construction is working well so far. We’ve found lots of ways to engage students in the process from planning to delivery with lots of golden moments. Peer-assessment: I want a more structured approach to this with the leading teams taking books away to mark using proper criteria, generating closing the gap actions. I left them to it too much last time and I don’t think we got enough value from the feedback. Using Edmodo for assignments and quizzes. I designed one big quiz but it has so many questions that I found it unwieldy to mark online – it took too long and I’ve abandoned it. I also learned that it must be all or none; I can’t have some work in books and some submitted online because it’s too confusing. Lesson planning. Daniel has set a standard. I think we need more set piece lesson plans like this; we did a couple too many on the fly that were less successful. Time for test follow-up. I need to make sure our topic tests are properly located in the masterplan with follow-up time built-in. Getting ahead. I may use the timeline to start the expert pre-learning earlier. For example the Pressure and Space team could be learning about that material now. Thanks to 9M for your efforts so far. I hope you’ve enjoyed it as much as I have. Amazing work. Will be keeping an eye on this one.